Rep. Ilhan Omar (D., Minn.) accused fellow Rep. Dan Crenshaw (R., Texas) of "virtue signaling" on Monday for refusing his congressional salary during the partial government shutdown. "We aren’t paid until Feb 1st, so no pay to withhold now," Omar wrote in a tweet. "Vote to reopen the government like we did & give hardworking Fed employees their paychecks. That’s caring! Stop with the virtue signaling Congressaman, the American people need this to end now, not Feb 1st." 1) We aren’t paid until Feb 1st, so no pay to withhold now. 2) Vote to reopen the government like we did & give hardworking Fed employees their paychecks. That’s caring! Earlier on Monday, Crenshaw tweeted that he was asking to have his salary withheld during the shutdown. "If Houston’s hardworking federal workers aren’t getting paid, then I shouldn’t be paid either. My pay will be withheld until the government reopens. Democrats have still not put forth any border security proposals. They can end this right now, and secure our border. Win-win," Crenshaw tweeted. Many Republican and Democratic congressmen and senators have decided to reject pay during the shutdown, while others are donating it to charity. 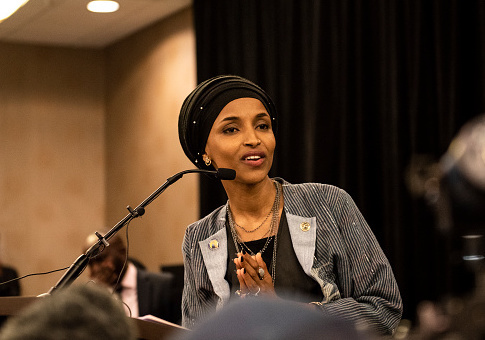 Rep. Angie Craig (D., Minn.), one of Omar's fellow Minnesota Democrats said she will not accept pay, while Sen. Tina Smith (D., Minn.) is donating her pay to a nonprofit. Other freshman Democrats are also rejecting or donating their pay, including Rep. Chris Pappas (D., N.H.), Rep. Abigail Spanberger (D., Va.), and Rep. Elissa Slotkin (D., Mich.). Omar has yet to call out any of her fellow Democrats for "virtue signaling." Congress and President Donald Trump are at an impasse over funding for a border wall that has resulted in a partial government shutdown, now in its 25th day. During a shutdown in 2013, government workers received backpay after it was resolved. Congress passed similar legislation on Thursday, so federal workers will receive the paychecks they missed because of the shutdown. This entry was posted in Politics and tagged Dan Crenshaw, Government Shutdown, Ilhan Omar. Bookmark the permalink.